Stylish and colorful, yet practical rainwear. 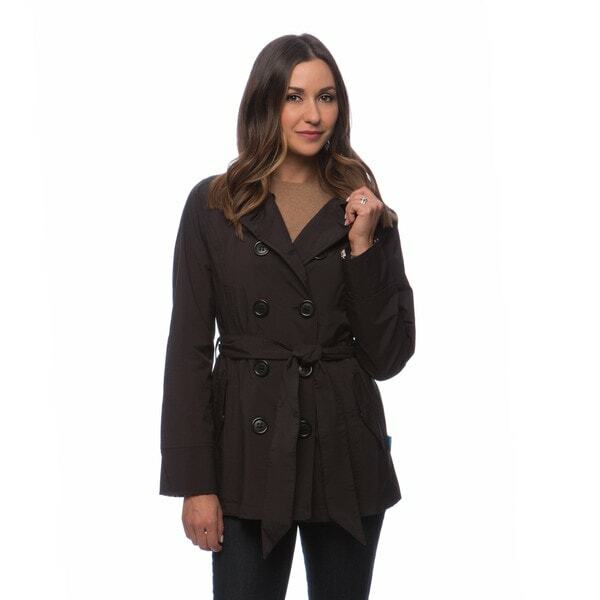 With a stunning flat collar, this a double-breasted trench coat can be worn up or down. Plus, the tie belt is great for accentuating your waist. The approximate length from the top center back to the hem is 24. The measurement was taken from a size Medium. Wasn’t nuts about this jacket. Cut is quite short. The blue color was too bright - looked kind of cheap. Just couldn’t see wearing that and think color would clash with a lot. Cut might be fine if you have a short torso and are shorter in general. This trench coat is perfect for those spring rainy days. It is nice enough to wear into the office yet casual enough to still wear with your favorite pair of jeans. I love it. Like the faux double breasted look and how the sleeves fold , looks good. I really like the buttons on it, stylish trench coat. This jacket is very stylish and comfortable. It repels water very well. I do wish it had a good. Otherwise, it was reasonably priced and looks great. It's a cute jacket but a bit boxy looking on and the lapels fold higher to the neck compared to the picture. Not 100% accurate depiction. It has a nice thin weight to it for cooler rainy days. The quality is great (as usual)! Took a long time to received but that was because it got lost in the shipping process but I eventually received it. It's a dead brown, for one thing, with hideous lining. The problem is, the sleeves are so long, I'd have to roll them up a bit, exposing the ugly pink, orange, and acid green cartoon flowers of the lining. meh. "Is there a hidden hood on this jacket? Thanks"
I bought this before but it was stolen...I LOVE this trench in the Blue and it fit me great b/c I am a bigger girl. So pleased to have found it again.